WARNER! NH: June 6 & 7 - Shakespeare’s "As You Like It"
June 6 & 7 - Shakespeare’s "As You Like It"
AS YOU LIKE IT... a love story, a tale of wit and foolery, of heartbreak and poetry, of questions and revealings. This hilarious and linguistically beautiful play — considered to be one of Shakespeare’s finest comedies — will be presented June 6th and 7th by the Homeschool Drama Troupe at the Warner Town Hall in Warner, New Hampshire. Come join the witty Rosalind, melancholy Jaques and clueless Orlando — as well as countless other fools and wise people — as the Homeschool Drama Troupe embarks to the Forest of Arden for its tenth-annual Shakespearean production. Founded by Jenny Courser and now directed by Lois Shea, the Homeschool Drama Troupe features a talented cast of actors: Jacob Aki of Weare; Molly Litt and Olivia Dodd of Dunbarton; Emily Vallari of Hopkinton; Fiona Shea and Natalie Dill of Warner; Sam and Stephen Brown and David Russell of New London; and Erin Meegan of Newbury. “Rosalind is one of Shakespeare’s strongest characters — which I’d never really given her credit for until I started studying this role,” said 18-year-old Fiona Shea, who plays the lead role. “She’s tough in the face of change, she’s not afraid to be the wittiest one in a room. She’s fiercely loyal to those she’s close to, and above all, she’s very self-aware. She’s willing to fall in love, though she knows she’s taking a huge chance. And while she’s partly teaching Orlando how to woo properly, she’s also teaching him how to be her equal. And that takes guts. Rosalind’s decision to disguise herself and seek her father, the banished Duke, in the Forest of Arden ignites a firestorm of hilarity. She discovers that the love of her life, Orlando, is also in the forest — and she proceeds to test how strong his love for her really is. 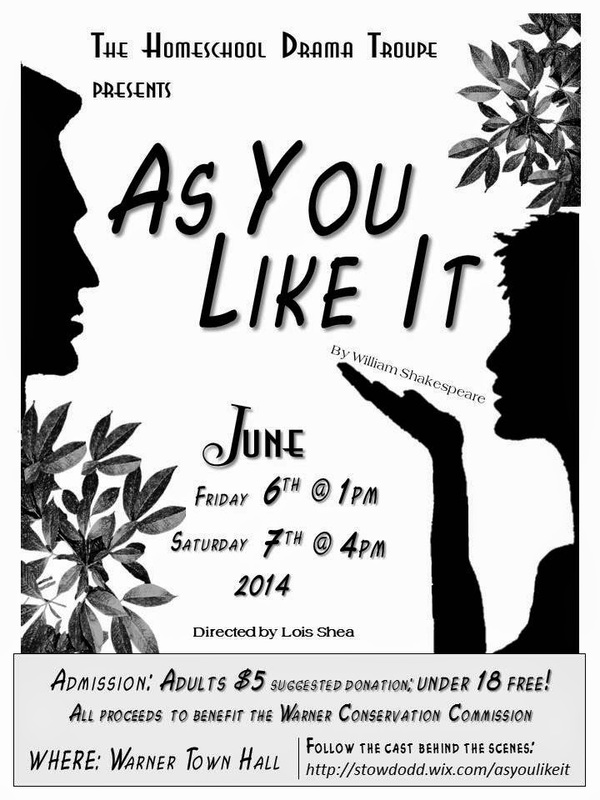 As You Like It is sponsored by the Warner Conservation Commission, and all proceeds will go toward the Commission’s land protection efforts in Warner. Performances will be Friday June 6th at 1 p.m. and Saturday June 7th at 4 p.m. at the Warner Town Hall. Admission is $5, Free for kids under 18.